Digital Directivity Control™ provides beam-STEERING, based on aiming parameters. Complex Digital Directivity Synthesis™ provides complex room coverage via beam-SHAPING. The shaping algorithm is based on a model of the room or listening space, resulting in consistent SPL and consistent frequency response from place to place within the listening space. WinControl™ – RAPID DDS™ (which is built into WinControl) selects the right DDS™ settings based on basic room and usage parameters. This same software then uploads the setting file to the speaker(s) by pressing “Apply”. DDA™ (Digital Directivity Analysis™) for modeling a listening space and computing DDS beam-SHAPING algorithms. Plus, WinControl™ for uploading the settings file to the speaker(s). Directly controls DDC™-driven products for: 1) aiming axis, 2) opening angle, and 3) focus distance. It is also used to set other audio parameters, including 8 parametric EQ bands, delay, AVC (automatic volume control) functions, volume level, surveillance related parameters, pilot tone detection, priority switching, 8 full presets, and more. Enables the upload of DDA™-calculated DDS™ directivity files to the speakers. RAPID DDS™ allows creation of DDS™ files to speakers without having to use DDA™. Integrates geometric modeling, direct sound prediction, statistical room acoustic prediction, graphic visualization, radiation pattern optimization and generation of output filter files. The file is transferred to WinControl™ for uploading to the DSP-units of the speakers. DDA supports all products (DC, DS and DSX) but you can only export beam SHAPING settings for DS and DSX. 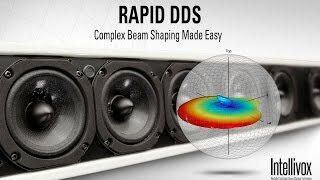 RAPID DDS™ is a simple and intuitive method for controlling the Intellivox DS and DSX ranges of Beam Shaping (DDS) loudspeaker arrays. RAPID DDS™ allows users to set (for simpler listening spaces) DDS beam-SHAPING settings directly from WinControl™, without having to first compute the settings via the DDA™ software. Unlike Beam STEERING, which is a point-and-shoot technology, Beam SHAPING allows users to create a tailor-made dispersion pattern that perfectly suits the shape of the audience plane while avoiding hard reflective surfaces.